Hand function assessment is essential for upper limb rehabilitation of stroke survivors. Conventional acquisition devices have inherent and restrictive difficulties for their clinical usage. Data gloves are limited for applications outside the medical environment, and motion tracking systems setup are time and personnel demanding. We propose a novel instrument designed as a replica of a glass, equipped with an omnidirectional vision system to capture hand images and an inertial measurement unit for movements kinematic data acquisition. Four stroke survivors were invited as volunteers in pre and post-treatment experiments for its evaluating. The exercise of drinking water from a glass was elected for the trails. Before treatment, subjects used their contralesional and ipsilateral hands to perform them. Two main functional features were found in the data analysis. There were differences between limbs in the grasping hand postures, mainly in the index and thumb abduction angle, and in the task timing. After treatment, two volunteers repeated the protocol with their contralesional hands. Changes in the features were observed, index and thumb abduction angles were greater in both cases, and tasks timing were altered in distinct ways. These preliminary results suggest the instrument can be used both in evaluation of hand functional deficit and rehabilitation progress. Improvements and future work are also presented. 1. R. L. Sacco, S. E. Kasner, J. P. Broderick, L. R. Caplan, A. Culebras, M. S. Elkind, M. G. George, A. D. Hamdan, R. T. Higashida, B. L. Hoh et al., “An updated definition of stroke for the 21st century: a statement for healthcare professionals from the american heart association/american stroke association”, Stroke, vol. 44, no. 7, pp. 2064-2089, 2013. 2. C. A. Doman, K. J. Waddell, R. R. Bailey, J. L. Moore, C. E. Lang, “Changes in upper-extremity functional capacity and daily performance during outpatient occupational therapy for people with stroke”, American Journal of Occupational Therapy, vol. 70, no. 3, pp. 7003290040pl-7003290040p11, 2016. 3. B. Brouwer, M. V. Sale, M. A. Nordstrom, “Asymmetry of motor cortex excitability during a simple motor task: relationships with handedness and manual performance”, Experimental Brain Research, vol. 138, no. 4, pp. 467-476, 2001. 4. J. Langan, P. van Donkelaar, “The influence of hand dominance on the response to a constraint-induced therapy program following stroke”, Neurorehabilitation and neural repair, vol. 22, no. 3, pp. 298-304, 2008. 5. H. I. Krebs, M. L. Aisen, B. T. Volpe, N. Hogan, “Quantization of continuous arm movements in humans with brain injury”, Proceedings of the National Academy of Sciences, vol. 96, no. 8, pp. 4645-4649, 1999. 6. B. Fisher, C. Winstein, M. Velicki, “Deficits in compensatory trajectory adjustments after unilateral sensorimotor stroke”, Experimental brain research, vol. 132, no. 3, pp. 328-344, 2000. 7. H. Sugarman, A. Avni, R. Nathan, A. Weisel-Eichler, J. Tiran, “Movement in the ipsilesional hand is segmented following unilateral brain damage”, Brain and cognition, vol. 48, no. 2-3, pp. 579-587, 2002. 8. D. A. Nowak, “The impact of stroke on the performance of grasping: usefulness of kinetic and kinematic motion analysis”, Neuroscience & Biobehavioral Reviews, vol. 32, no. 8, pp. 1439-1450, 2008. 9. M. Coluccini, E. S. Maini, C. Martelloni, G. Sgandurra, G. Cioni, “Kinematic characterization of functional reach to grasp in normal and in motor disabled children”, Gait & posture, vol. 25, no. 4, pp. 493-501, 2007. 10. E. Jaspers, H. Feys, H. Bruyninckx, J. Harlaar, G. Molenaers, K. Desloovere, “Upper limb kinematics: development and reliability of a clinical protocol for children”, Gait & posture, vol. 33, no. 2, pp. 279-285, 2011. 11. D. A. Nowak, J. Hermsdörfer, H. Topka, “Deficits of predictive grip force control during object manipulation in acute stroke”, Journal of neurology, vol. 250, no. 7, pp. 850-860, 2003. 12. R. W. Bohannon, “Adequacy of hand-grip dynamometry for characterizing upper limb strength after stroke”, Isokinetics and exercise science, vol. 12, no. 4, pp. 263-265, 2004. 13. H. Zhou, H. Hu, “Human motion tracking for rehabilitationâĂŤa survey”, Biomedical Signal Processing and Control, vol. 3, no. 1, pp. 1-18, 2008. 14. A. C. P. Rocha, E. Tudella, L. M. Pedro, V. C. R. Appel, L. G. P. da Silva, G. A. d. P. Caurin, “A novel device for grasping assessment during functional tasks: preliminary results”, Frontiers in bioengineering and biotechnology, vol. 4, pp. 16, 2016. 15. E. Taub, G. Uswatte, “Constraint-induced movement therapy: bridging from the primate laboratory to the stroke rehabilitation laboratory”, Journal of Rehabilitation Medicine-Supplements, vol. 41, pp. 34-40, 2003. 16. R. d. N. B. Marques, A. C. Magesto, R. E. Garcia, C. B. d. Oliveira, G. d. S. Matuti, “Efeitos da terapia por contensão induzida nas lesões encefálicas adquiridas”, Fisioterapia Brasil, vol. 17, no. 1, pp. f-30, 2016. 17. E. E. Butler, A. L. Ladd, L. E. LaMont, J. Rose, “Temporal-spatial parameters of the upper limb during a reach & grasp cycle for children”, Gait & posture, vol. 32, no. 3, pp. 301-306, 2010. 18. E. E. Butler, A. L. Ladd, S. A. Louie, L. E. LaMont, W. Wong, J. Rose, “Three-dimensional kinematics of the upper limb during a reach and grasp cycle for children”, Gait & posture, vol. 32, no. 1, pp. 72-77, 2010. 19. L. Gauthier, Structural brain changes produced by different motor therapies after stroke, 2011. 20. L. M. Pedro, G. A. de Paula Caurin, “Kinect evaluation for human body movement analysis”, Biomedical Robotics and Biomechatronics (BioRob) 2012 4th IEEE RAS & EMBS International Conference on, pp. 1856-1861, 2012. 21. A. Hussain, S. Balasubramanian, N. Roach, J. Klein, N. Jarrassé, M. Mace, A. David, S. Guy, E. Burdet, “Sitar: a system for independent task-oriented assessment and rehabilitation”, Journal of Rehabilitation and Assistive Technologies Engineering, vol. 4, pp. 2055668317729637, 2017. 22. L. R. L. Cardoso, M. N. Martelleto, P. M. Aguiar, E. Burdet, G. A. P. Caurin, L. M. Pedro, “Upper limb rehabilitation through bicycle controlling”, 24th International Congress of Mechanical Engineering, 2017. 23. M. N. Martelleto, P. M. Aguiar, E. Burdet, G. A. P. Caurin, R. V. Aroca, L. M. Pedro, “Instrumented module for investigation of contact forces for use in rehabilitation and assessment of bimanual functionalities”, 24th International Congress of Mechanical Engineering, 2017. Individuals who have not suffered a neurological injury use their dominant hand for an average of 9 hours per day. Patientsless than 14 days following stroke use their affected upper limb only 38 minutes out of a 9-hour day. If the hand and arm muscles are no longer functional, it’s especially important to re-learn basic functions first, such asgrasping and releasing objects. A stroke rehabilitation device like the SaeboFlex can make this process easier for some patients and possible for those who otherwise would have no function left. This paper describes the design of a FES system automatically controlled in a closed loop using a Microsoft Kinect sensor, for assisting both cylindrical grasping and hand opening. The feasibility of the system was evaluated in real-time in stroke patients with hand function deficits. A hand function exercise was designed in which the subjects performed an arm and hand exercise in sitting position. The subject had to grasp one of two differently sized cylindrical objects and move it forward or backwards in the sagittal plane. This exercise was performed with each cylinder with and without FES support. Results showed that the stroke patients were able to perform up to 29% more successful grasps when they were assisted by FES. Moreover, the hand grasp-and-hold and hold-and-release durations were shorter for the smaller of the two cylinders. FES was appropriately timed in more than 95% of all trials indicating successful closed loop FES control. Future studies should incorporate options for assisting forward reaching in order to target a larger group of stroke patients. Stroke survivors who experience severe hemipare-sis often cannot completely recover the use of their hand and arm. Many of the rehabilitation devices currently available are designed to increase the functional recovery right after the stroke when, in some cases, biological restoring and plastic reorganization of the central nervous system can take place. However, this is not always the case. Even after extensive therapeutic interventions, the probability of regaining functional use of the impaired hand is low. In this respect, we present a novel robotic system composed of a supernumerary robotic finger and a wearable cutaneous finger interface. The supernumerary finger is used to help grasping objects while the wearable interface provides information about the forces exerted by the robotic finger on the object being held. We carried out two experiments, enrolling 16 healthy subjects and 2 chronic stroke patients. Results showed that using the supernumerary finger greatly improved the grasping capabilities of the subjects. Moreover, providing cutaneous feedback significantly improved the performance of the considered task and was preferred by all subjects. This paper describes the design and initial prototype of a thumb curling exoskeleton for movement therapy. This add-on device for the Finger INdividuating Grasp Exercise Robot (FINGER) guides the thumb through a single-degree-of-freedom naturalistic grasping motion. This motion complements the grasping motions of the index and middle fingers provided by FINGER. The kinematic design and mechanism synthesis described herein utilized 3D motion capture and included the determination of the principle plane of the thumb motion for the simple grasping movement. The results of the design process and the creation of a first prototype indicate that this thumb module for finger allows naturalistic thumb motion that expands the capabilities of the FINGER device. This paper reports on the development of a low-profile exoskeleton module to enable training of the fingers and thumb in grasp and release tasks. The design has been made as an add-on module for use with the ArmAssist arm rehabilitation system (Tecnalia, Spain). Variable-position springs and adjustable link lengths provide adaptability to fit a variety of users. Additive manufacturing has been utilized for the majority of components allowing easy modifications. A few structural components were machined from aluminum or steel to produce a functional prototype with sufficient strength for direct evaluation. The design includes independent and adjustable assistance in finger and thumb extension using various width elastic bands, and measurement of user grasp/release forces in finger flexion/extension, thumb flexion/extension, and thumb adduction/abduction using low-profile force sensitive resistors. Among the most promising field of applications of wearable robotics there are the rehabilitation and the support in activities of daily living (ADL) of impaired people. In this paper, we propose two possible designs of a robotic extra-finger, the Robotic Sixth Finger, for grasping compensation in patients with reduced hand mobility, such as post-stroke patients. The idea is to let the patients be able to grasp an object by taking advantage of the wearable device worn on the paretic limb by means of an elastic band. The Robotic Sixth Finger and the paretic hand work jointly to hold an object. Adding a robotic opposing finger is a promising approach that can significantly improve the grasping functional compensation in different typologies of patients during everyday life activities. Wearable robots are expected to work very closely, to interact and collaborate with people in an intelligent environment . Traditionally, wearable robotic structures have been mainly used in substitution of lost limbs (e.g., prosthetic limbs) or for human limb rehabilitation (e.g., exoskeletons). However, the progress in miniaturization and efficiency of the technological components is allowing more light and compact solutions, enhancing user’s safety and comfort, while opening new opportunities for wearable robot use . Together with exoskeleton and prosthesis, a very promising research direction seems to be that of adding robotic limbs to human, rather than substituting or enhancing them . This addition could let the humans augment their abilities and could give support in everyday tasks to impaired people. This paper investigates how to compensate the capabilities of the human hand, instead of developing additional robotic extra-arms, as discussed for instance in . The idea of using an extra-finger to support the human hand in grasping functions was initially proposed in . Then, independently both in  and [7, 8], the authors proposed the use of extra fingers to support the human hand to grasp objects whose size does not fit a hand or in executing bimanual tasks with one hand. The main difference is that in [7, 8], the goal was to minimize the size and the weight of the unique extra limb, while in , two extra fingers were used so to hold objects. While in  the authors developed a control strategy to grasp and manipulate objects, in  the authors mainly focused on the use of extra fingers for post-stroke patients. Focusing on the hand, many wearable devices have been proposed in the last decade, especially for hand rehabilitation and function recovery. A review on robotassisted approaches to motor neurorehabilitation can be found in . In  the authors presented a comprehensive review of hand exoskeleton technologies for rehabilitation and assistive engineering, from basic hand biomechanics to actuator technologies. However, most of the devices proposed in literature are designed either to increase the functional recovery in the first months of the rehabilitation therapy, when biological restoring and reorganization of the central nervous system take place, or are designed to augment human hand capabilities of healthy subjects by coordinating the device motion to that of the hand. To the best of our knowledge, only few works target on the robotic compensation of hand function in the latter phase of rehabilitation. This means that patients usually after 6–9 months of rehabilitation must rely only on compensatory strategies by improving adaptations that increase the functional disparity between the impaired and the unaffected upper limb . This work focuses on the compensation of hand function in patients with paretic limbs, e.g. chronic stroke patients. The final aim is to provide the patient with an additional robotic finger worn on the wrist. The Robotic Sixth Finger is used together with the paretic hand to seize an object, as shown in Fig. 1. The systems acts like a two-finger gripper, where one finger is represented by the Robotic Sixth Finger, while the other by the patient paretic limb. 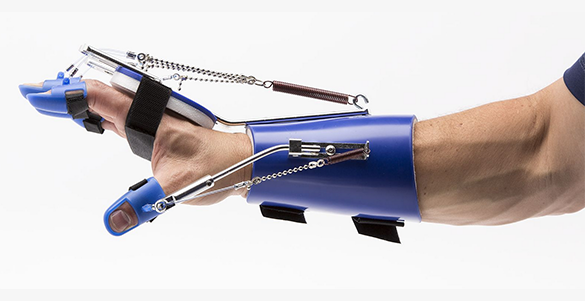 The proposed device goes beyond exoskeletons: it adds only what is needed to grasp, i.e. an extra thumb. We presented in  a preliminary version of a robotic extra-finger showing how this wearable device is able to enhance grasping capabilities and hand dexterity in healthy subjects. In , we also presented an object-based mapping algorithm to control robotic extra-limbs without requiring explicit commands by the user. The main idea of the mapping was to track human hand by means of dataglove and reproduce the main motions on the extra-finger. This kind of approach is not suitable for patients with a paretic limb due to the reduced mobility of the hand. Therefore, we developed a wearable interface embedded in a ring to activate and use the finger . In this work, we propose two possible designs of devices. The first model is a modular fully actuated finger. The other design consists of an underactuated finger which is compliant and consequently able to adapt to the different shapes of the objects. For validation purposes, pilot experiments with two chronic stroke patients were performed. The experiments consisted in wearing the Robotic Sixth Finger and performing a rehabilitation test referred to as Frenchay Arm Test [15, 10]. Finally, we present preliminary results on the use of the extra-fingers for grasping objects for Activities of Daily Living (ADL). This paper presents the Soft-SixthFinger, a wearable robotic extra-finger designed to be used by chronic stroke patients to compensate for the missing hand function of their paretic limb. The extra-finger is an underactuated modular structure worn on the paretic forearm by means of an elastic band. The device and the paretic hand/arm act like the two parts of a gripper working together to hold an object. The patient can control the flexion/extension of the robotic finger through the eCap, an Electromyography-based (EMG) interface embedded in a cap. The user can control the device by contracting the frontalis muscle. Such contraction can be achieved simply moving his or her eyebrows upwards. 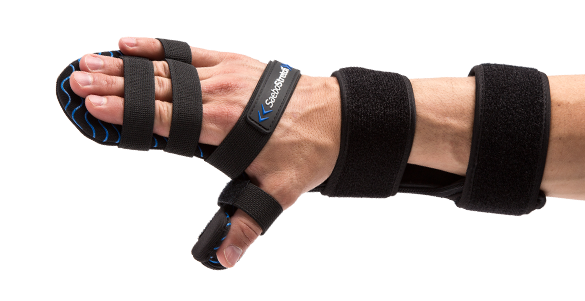 The Soft-SixthFinger has been designed as tool that can be used by chronic stroke patients to compensate for grasping in many Activities of Daily Living (ADL). It can be wrapped around the wrist and worn as a bracelet when not used. The light weight and the complete wireless connection with the EMG interface guarantee a high portability and wearability. We tested the device with qualitative experiments involving six chronic stroke patients. Results show that the proposed system significantly improves the performances of the patients in the proposed tests and, more in general, their autonomy in ADL. The aim of this study is to develop a valid and standardized instrumental analysis of upper limb (UL) motion in stroke patients. Sixteen controls and 15 hemiparetic subjects (mean age = 54 ± 18,2 years old; Fugl-Meyer Upper Limb 41,4 ± 12,4) underwent kinematic motion analysis (passive markers, Optitrack) of pointing and grasping tasks. We examined the ability to perform a single pointing task and three reach-to-grasp tasks: key turning, reaching and grasping a can, reaching and grasping a cube; at a self-selected speed and as fast as possible. Speed, accuracy and efficiency of each movement were quantified and compared between controls and hemiparetic subjects, and between the ipsilateral of control subjects and the affected side; to describe reaching and grasping. For reaching, movement time of hemiparetic UL was longer, less smooth (peak velocity, jerk), less direct (higher index path ratio) and associated with more trunk compensation (higher trunk/hand ratio). Movement time, jerks and trunk/hand ratio were the most discriminant variables between hemiparetic UL and ipsilateral/control UL, in any task analysed. Trunk displacement was greater in grasping than in reaching tasks. For grapsing tasks, movement time is the most discriminant factor between hemiparetic and control/ipsilateral UL, especially for the key turn task. Movement alterations were also found for ipsilateral limb. Association between kinematic variables and clinical features during reaching time (Fugl-Meyer, MAL, WFMT, ARAT) was greater for the task “grasping a can”. Our results are similar to those of the literature, but suggest that we have to privilege some of the most relevant kinematic parameters. This standardization phase emerging after a validation phase of the techniques can make the biomechanical analysis of the upper limb as easy and valid as gait analysis and should help to develop the quantified measurement of prehension. This protocol is currently in process to objectively assess the therapeutic effects of rehabilitation treatments (botulinum toxin, induced constraint therapy).